PRESSCOMFORT is an automatic electronic appliance, destined to regulate functioning of the electric pumps without using booster reservoirs. This unit manages the automatic start and stop of the pump when opening or closing any tap or valve of the installation. When the pump starts, it keeps running while it exists any tap opened in the system, giving flow and pressure to the hydraulic net while ther is demand. If there is no suction air, the pump stops automatically. – automatic restore after 1, 6, 12 o 24 hours. (1.5 bar) for pump start-up, PRESSCOMFORT is restored automatically. 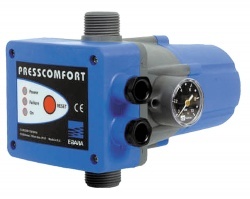 The PRESSCOMFORT is replacing the traditional expansion tank, pressure switch, check valves, level switch.